Tired of lugging all your stuff out to an overcrowded beach? 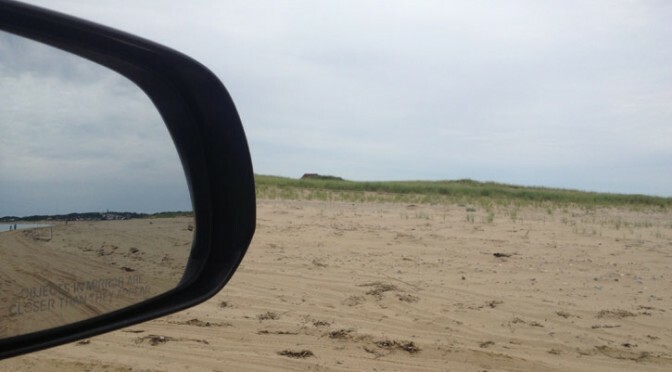 These tips will prepare you to drive on the oversand trails at some of the most beautiful beaches on cape cod. 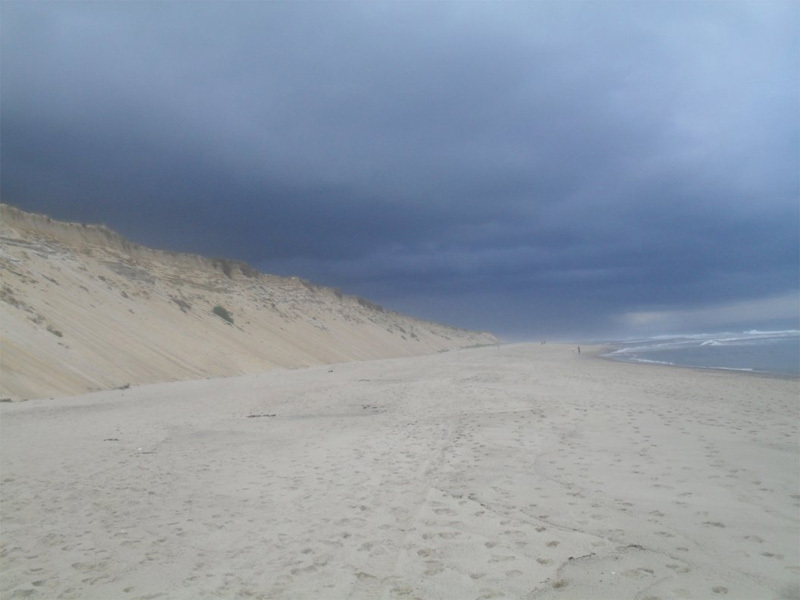 Nauset beach is a thin stretch of land extending from the elbow of the cape in Chatham down towards monomoy. when the trails are opened, much of the beach is accessible using orv trails. The resident orv section sits north of the public beach, and the non-resident orv section sits to the south and extends into chatham. 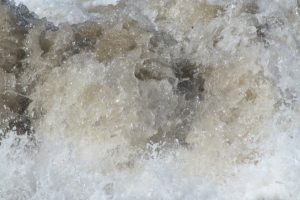 The water at nauset is extremely cold, and the surf can be rough. Seals love the place. As do sharks. Be smart and don’t get bit. Some of the biggest great whites seen on cape cod have been tagged off nauset, and every year the numbers go up. surfers be warned. 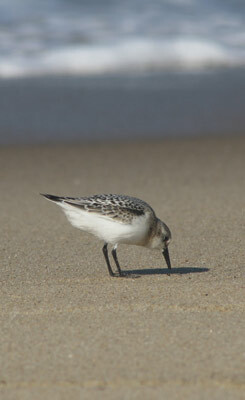 ORV trail access at nauset is deeply impacted by nesting piping plovers. Years ago the beach would be open access all summer long, and then plover closings began closing the beach from roughly Memorial Day through Labor Day. 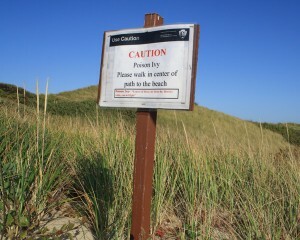 In recent years Orleans has experimented with new restrictions to restore limited access to trails at certain times of day when escorted by beach staff. It’s not without its drawbacks, but yet still represents a good step forward as an approach to deal with well-intentioned yet problematic wildlife regulations. it’s worth a quick check online or calling over to the beach to ensure that the beach will be open if you’re planning to get an orv sticker at nauset on your vacation. 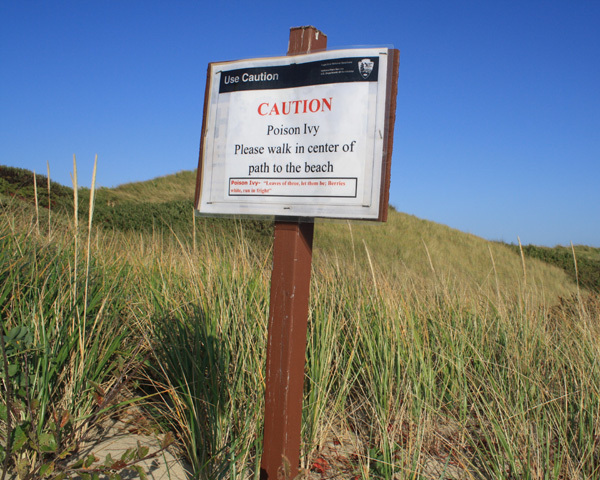 leashed dogs are allowed at nauset’s orv beach, but not on the main public beach. dogs are allowed offleash by the water if under voice control. 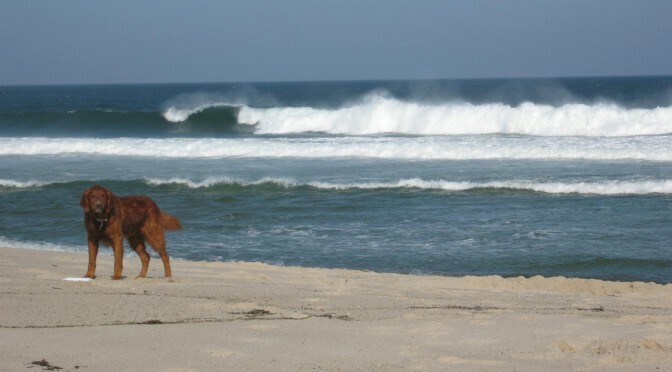 make sure your dog is a strong swimmer, big waves and strong undertows are the norm here. camping is allowed at nauset beach with an orv sticker. be sure to double check that access for campers is being allowed before planning your vacation around it though. all campers over age 12 are required to have a fishing pole. 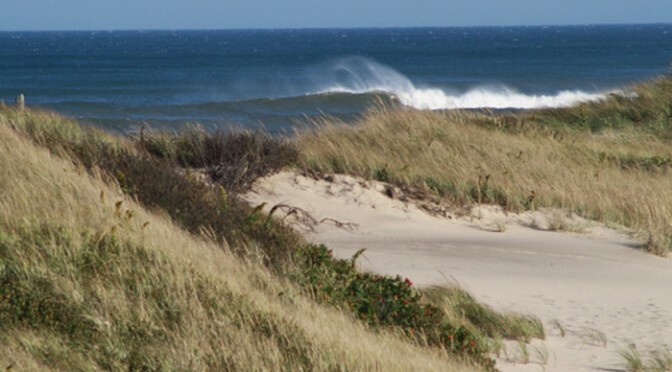 cape cod national seashore has the most extensive oversand driving trails on cape cod. 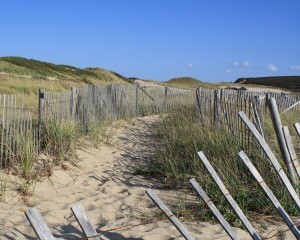 much of the access is often limited by erosion and nesting shorebirds, but in theory you can travel nearly the length of provincetown on the trails. truly epic. The seashore issues up to 400 active 7-Day permits at any time, with 3000 annual permits available. THe orv trails at coast guard road beach are open for night fishing only. No daytime access. The oversand driving trail goes right through the public beach area, so this restriction makes a lot of sense. it also means the orv section of the beach doesn’t get a lot of traffic. It’s a great place to cast in a line, drink a beer, and watch seals swim by with fish in their mouths while you don’t catch a thing. Make sure you get your saltwater fishing permit, it’s only $10. Coast guard road is popular with vacationers from several nearby dog-friendly campgrounds, so there’s usually lots of cool dogs to sniff. There’s a few parking spots for truro residents with stickers, and the parking lot is narrow, so use caution when driving through the lot and accessing beach. At night you’ll pass bonfires at the bottom of the trail onto the beach, and those folks occasionally are having a beer or two or ten so be cautious. Note that Coast guard road beach in truro is not the same thing as coast guard beach in eastham (another national seashore beach, but without orv access). the orv trails at race point beach allow oversand driving access that passes within inches of historic race point light in provincetown. 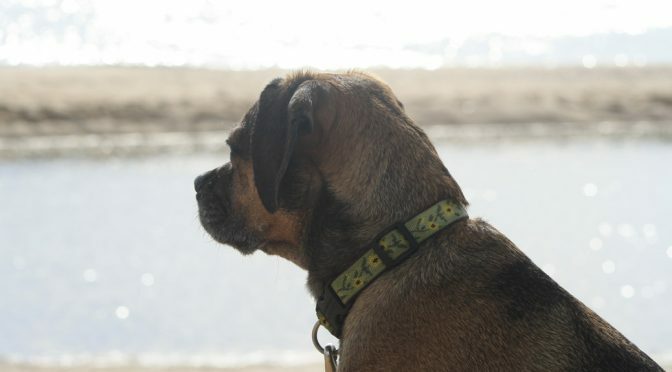 race point beach in is one of the premier beaches in the united states, and one of the 5 best places for dogs in provincetown. 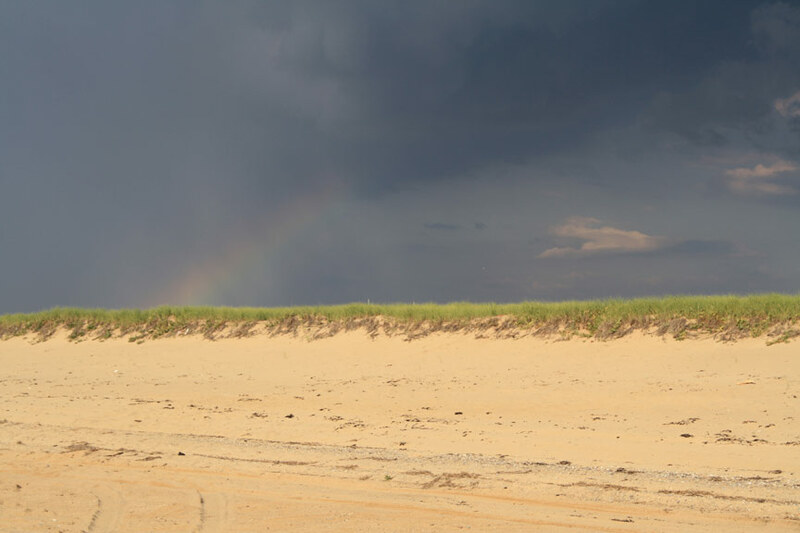 situated at the top of cape cod when looking at a map, the orv trails extend to the north and south sides of the main beach. orv access is affected by piping plovers, but the national seashore does a good job of maintaining some beach access most of the time. when beach access is very limited, as it was just prior to the 4th of july 2015, then cars will be parked on top of each other like a walmart parking lot. but typically when things are more open, you’ll have a lot more room between parked vehicles. Race point offers a variety of beach conditions. Hatches harbor, accessible from the trail near race point lighthouse, has unusually warm water. it’s also very packed due to this. big groups of people frequent this area, can be a pretty lively scene. as you drive along hatches harbor towards herring cove to the north, dogs are restricted. there are some amazing views in this area worth checking out. other sections of race point offer sandbars with pools for children and smaller dogs. 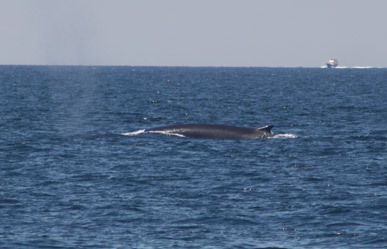 Whales can be seen most of the summer off of the race point beaches, just look for spouts, breaches, and stopped whale watch boats. 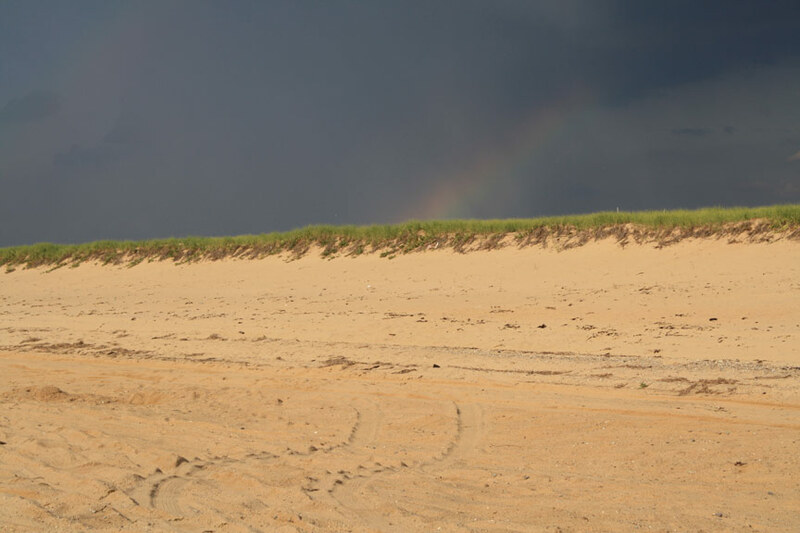 if you don’t have the appropriate vehicle for the beach but still want to see race point beach, you can get guided beach tours from Art’s Dune Tours in provincetown. They even offer lobster dinners at sunset. High head is accessible off of route 6 on high head road. Typically only a small part of high head’s orv trails are open. but it’s really beautiful here, and most people are thankful for what they can get. there are no air pumps, and no nearby gas stations. so make sure you plan accordingly before airing down, unless you feel like entering back onto route 6 in four nearly-flat tires. The parking area at high head can get pretty busy, it seems very popular with dog walkers and nature enthusiasts. Head of the meadow is a beautiful beach. soft, delicate sand that rivals any beach on cape cod. but the oversand driving trails haven’t been opened the past few years. Call before making plans to visit. There isn’t an air filling station here, but there is a gas station at the end of the street by route 6 that can help you air up. When we last visited, the trail to exit the beach was extremely steep and nearly impassible to a number of vehicles. Lots of shoveling and dropping more air. Not very fun. not recommended for inexperienced beach drivers. 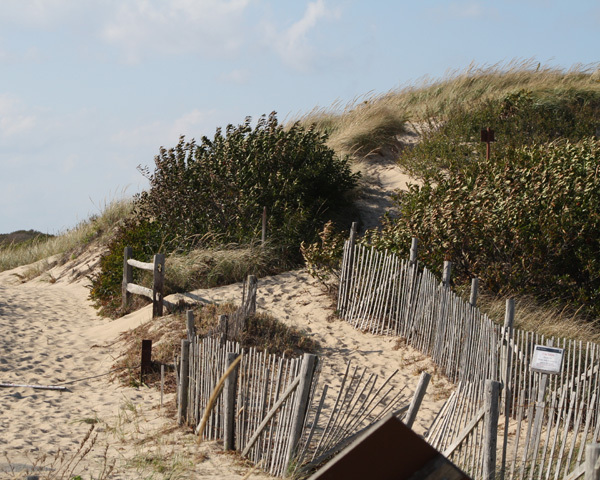 even if orv access isn’t available, consider visiting the main public beach—it’s one of the best on the cape and not as busy as most of the other seashore beaches. the orv trail at head of the meadow beach is often closed. 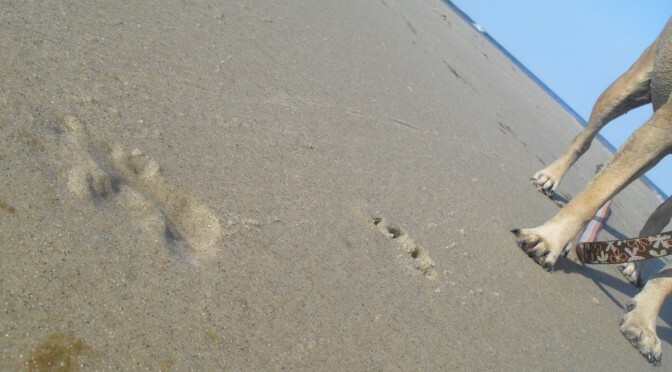 note the footprints and lack of tire prints. poison ivy surrounds this trail, beware. ORV passes are sold at the sandy neck gatehouse for 4wd and AWD vehicles, as well as 2wd campers. Annual passes are $85 for residents and $170 for non-residents. Camping is $10 for residents and $20 for non-residents in self contained campers (orv stickers are also needed to camp). You can camp in a tent for $20 in a designated area. Campfires allowed after sunset/7pm. 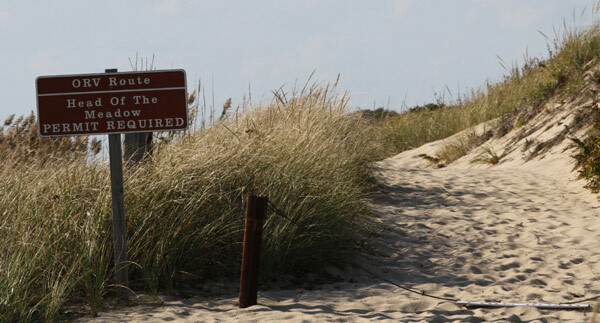 view the sandy neck beach website for vehicle requirements and other regulations. note that glass bottles are not allowed! 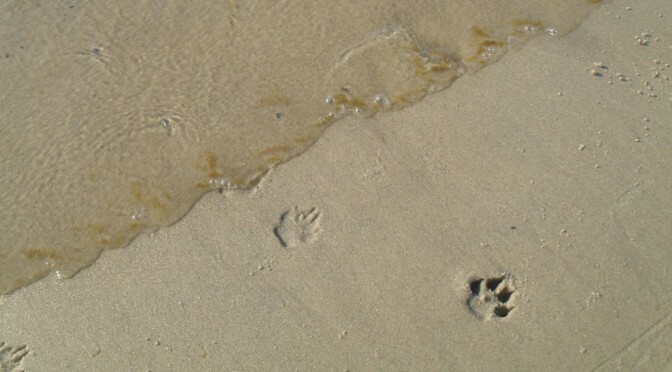 dogs are allowed on the orv area of sandy neck year round, but not on the main beach from May 15—sept 15. dogs must be leashed on the sandy neck corridor and trails from March 1—sept. 15 unless in cape cod bay. Make sure to check that your tires meet minimum size requirements. Spare tires too! Full size spare tire. No donuts! Sizes vary by beach (ex: check National Seashore tire size chart) but most midsize SUVs and truck tires are large enough. Always make sure to check with the beach regulations first to make sure yours are big enough. If you’re driving a camper or slide-in truck camper, you’ll need a fire extinguisher and permanently mounted tanks for grey and black water. The biggest rule: be considerate. To the beach, other people, wildlife, and to nature in general. The vehicle traveling with the ocean on their right side has the right of way when oncoming vehicles meet on an oversand driving trail. But don’t be afraid to pull off if you have an easier place to do it, even if you have the right of way. Be sure to wave at drivers who pull off the trail to let you pass. Never walk on sand dunes at the beach!!! Never walk or drive on the dunes. The vehicle trails are located above the high tide line for a reason. Never drive in the water, or even near it! be respectful. pick up your trash, and don’t be afraid to pick up trash you find. help keep these beaches beautiful! 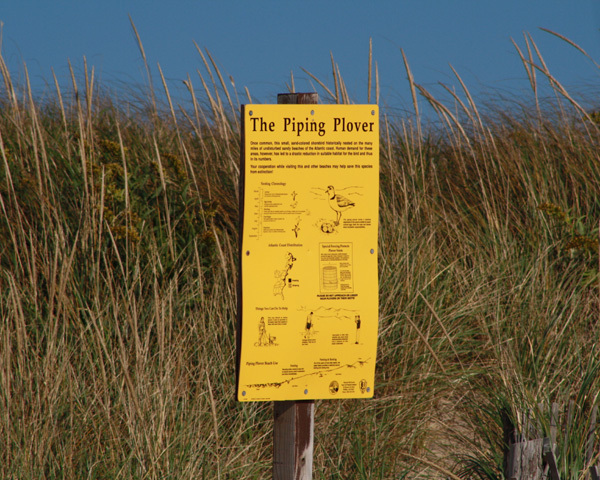 Often sections of the beach are closed due to tides or nesting shorebirds. While this can be annoying to vacationers, please abide by the signs and don’t travel in prohibited areas. Doing so jeopardizes oversand driving access for everyone. don’t want to get stuck? The biggest rule is to make sure to air down your tires to recommended levels, typically 11 PSI or lower. This increases the size of the tire that comes in contact with the sand, keeping your vehicle from sinking in. the beaches are filled with tough guys who don’t air down enough (“I don’t need to in MY truck!”) but this just chops up the trails for everyone else. observe speed limits, which often are 15 mph unless otherwise noted. When passing camping areas, speed limit is 5 mph. Slow down around kids, often they dart out between parked cars. Be safe. If you do start to get stuck, Do not gun the engine to get out! This will just bury you further. Best bet is to reduce air in your tires, and slowly try to get out. If need be, use a shovel to fill in any big holes you left. Worse case someone can use the tow strap to pull you out. So to avoid being the subject of 100 “told you so” conversations at once, air down to 11psi or lower in the parking lot. 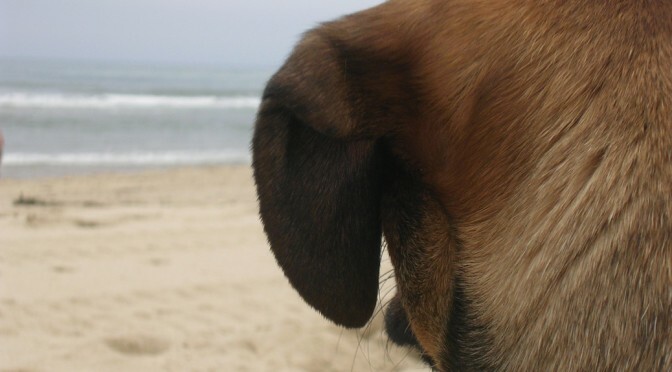 Dogs are allowed at all of the oversand beaches above, but there are limitations. Leashes are required unless dogs are swimming. always clean up after your dog. 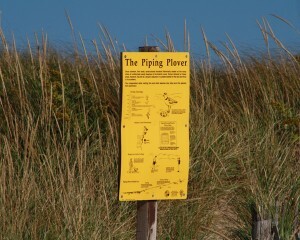 observe posted signs for restricted access due to piping plovers and other shorebirds. Beach access on some trails may be limited by high tide. Be sure to park above high water line. beach conditions constantly evolve, and the national park service does a good job letting you known when there’s an area of concern. booze is allowed on beaches, but not in moving cars. open containers are felonies. smarten up. and remember the national seashore beaches are federal property and subject to federal (not state) laws. Thinking of you there, cheech. Race point’s north beach has a portable toilet at hatches harbor near the lighthouse, but the other beaches don’t. plan accordingly. the water is pretty cold around here. THe most important rule: help keep these beaches beautiful. pick up litter. clean up dog poop. cover up pee spots with sand. and remember that in a single day the many thousands of seals poop and pee a whole lot more than all the dogs and people on the beach combined, so the water isn’t as clean as it looks. like most cape cod beaches, pesky greenheads, black flies, no seeums, and many other insects will bite you. keep insect repellent in your car or beach bag. ticks are plentiful too, so check dogs and kids closely. 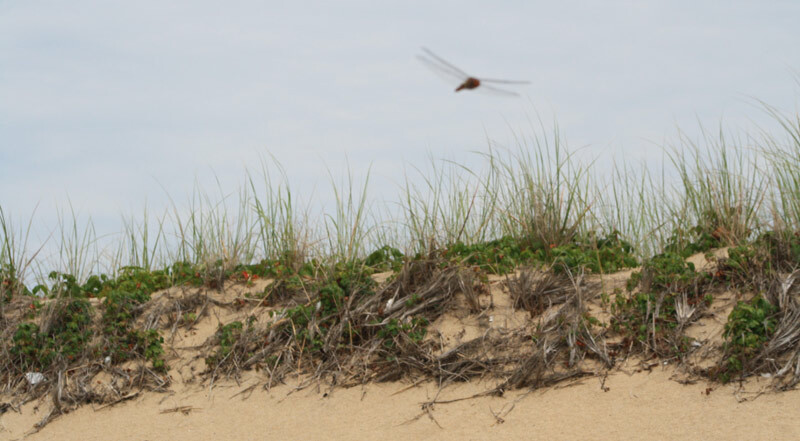 A dragonfly cruises near sand dunes at race point beach. 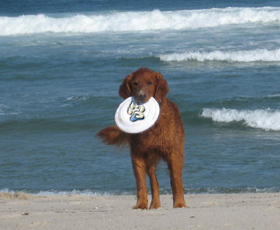 The Cape Cod National Seashore beaches are among the most dog-friendly beaches on Cape Cod. Sprawling sand dunes frame endless stretches of white sand under the crashing power of the Atlantic ocean. Cape Cod National Seashore beaches are perfect for long dog walks, sunbathing, surfing, fishing for striped bass, and endless rounds of fetching a tennis ball from the surf. the most popular national seashore beach is herring cove, located inside the hook of the cape where it wraps around towards the center of Provincetown. 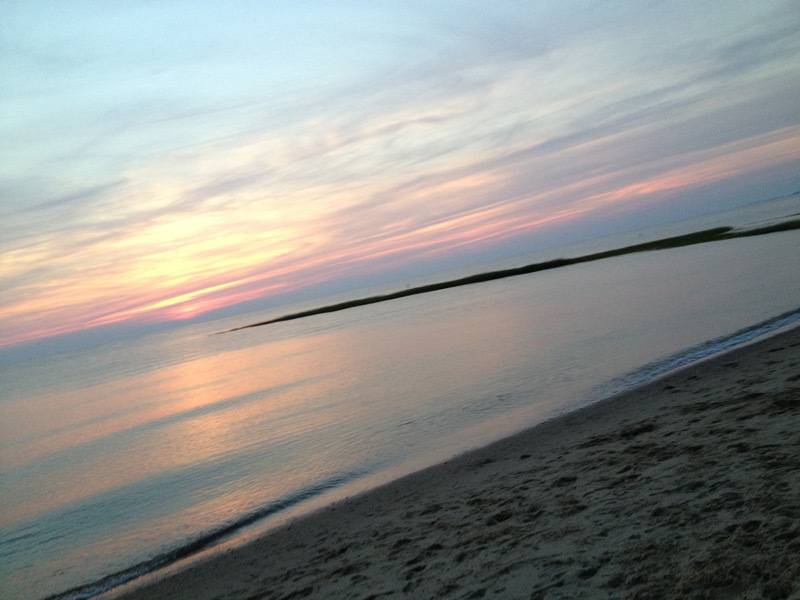 Race point beach in provincetown is located at the top of the cape when looking at a map of cape cod. Race point beach is simply amazing, with diverse sections where waves are gentle and sunsets are breathtaking. 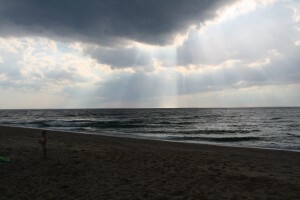 In north truro you will find head of the meadow beach, the least crowded of all the national seashore beaches. Here you will find smaller crowds, orv trail access (some years, anyway), as well as perfect sandbars and unspoiled dunes. The vibe at head of the meadow beach is very laid back, and you can expect to make friends with other dogs and their owners enjoying the sandbars. 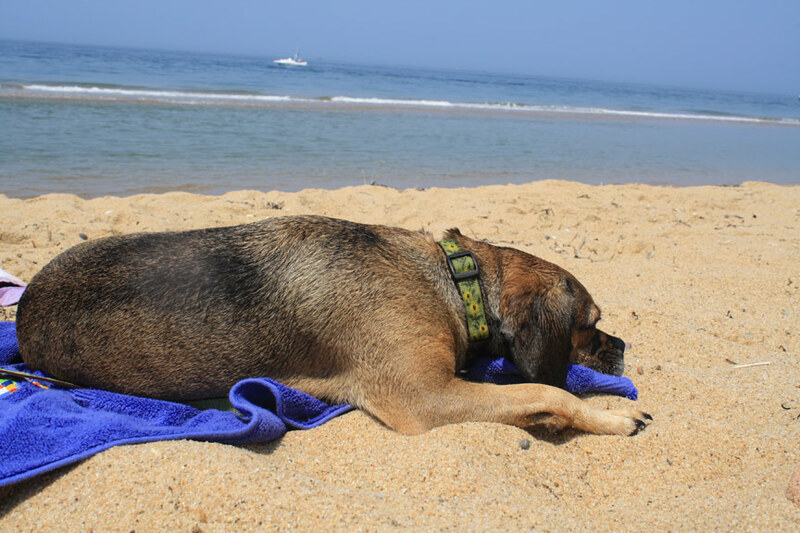 Marconi Beach in South Wellfleet, MA offers towering sand dunes set upon a seemingly endless stretch of beach that is filled with many tail wagging dogs all summer long. This is the largest of the national seashore beaches with a parking lot that rarely fills up. Marconi has ample room for dog owners on each end of the protected beach. The steep stairs down the sand dunes to access the beach can be difficult for some folks. Marconi Beach’s dog rules are the same as the pet regulations at the other cape cod national seashore beaches. The u.s. national park service has made parking fees to the marconi beach and the cape cod seashore beaches affordable to all visitors. a one-day parking pass at marconi beach is $15, but $45 will purchase a season-long pass for your vehicle. ORV vehicle oversand driving passes are also available at the cape cod national seashore for select beaches (but there’s no oversand driving at Marconi). If you are over 65 you are eligible for a lifetime national parks pass for $10 which grants access to you and all passengers in your car. There are also free weekends at the beginning and end of each season. 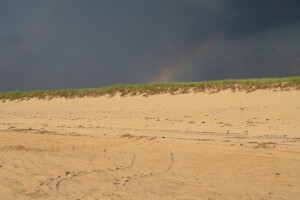 A storm quickly approaching the towering sand dunes of Marconi Beach. Marconi is dog friendly all summer long. The money from parking sticker fees at marconi beach is directed back to the national seashore beaches to provide the bathrooms, changing rooms, outdoor showers, lifeguards, and park rangers that keep the park safe, clean and enjoyable for the thousands of visitors who enjoy these unspoiled cape cod beaches each year. 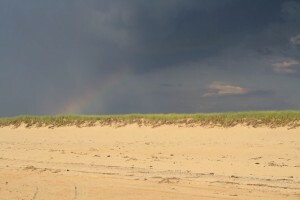 Marconi beach has several large sand bars which are perfect places to walk with your dog. the sandbar conditions at marconi are perennially evolving. At high tide these bars can create excellent wave conditions for surfers and bodysurfing. 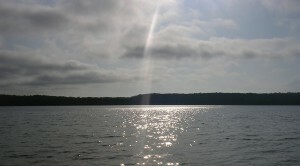 Fisherman eager or striped bass or schools of bluefish do well surfcasting here as well. in order to fish for cape cod striped bass, you need to obtain a saltwater fishing license for a cost of $10. check with local bait shops for info on noteworthy fishing locations and advice on the best bait for striped bass at that point of the fishing season. 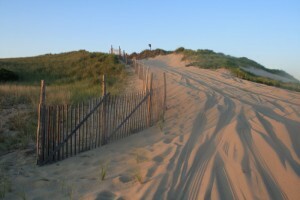 Marconi Beach has the tallest sand dunes of the national seashore beaches on cape cod. NEVER CLIMB THE SAND DUNES! Every time we visit Marconi beach we see families that allow their children (and even some dumb adults!) 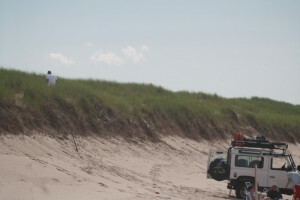 to climb up Marconi Beach’s majestic sand dunes. This is disgraceful behavior. erosion is a major threat to marconi beach and other cape cod beaches. Please respect and help preserve the beauty of these beaches, don’t ruin it for everyone else. Marconi beach is as vast as its parking lot, and even on the busiest weekend days the willing can walk far enough away from the crowd to enjoy plenty of space and tranquility. There have been gorgeous sandbars at Marconi for the past few years, providing shallow swimming, tranquil water, flats for running beside the water and hours of low tide fun for children and dogs alike. Seals are prevalent at Marconi beach, just look out to sea and you’re sure to see a few. seals have been observed being attacked by great white sharks on cape cod in recent years. take precautions to protect yourself from shark attacks on cape cod. 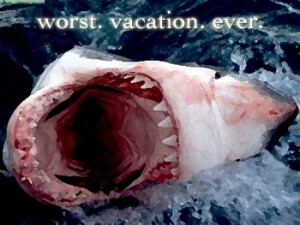 Learn how to protect yourself from great white sharks on cape cod. The sun sets directly behind the tall sand dunes at Marconi Beach, putting the entire beach in shadow earlier than at other cape cod national seashore beaches. It can get windy so bring a sweatshirt if you plan on visiting marconi in the early evening. be prepared for a very beautiful sunset as you ascend the stairs to the boardwalk to the parking lot at this time of day. These stairs can be steep for families with children and lots of stuff to carry. When unloading your car in Marconi’s designated drop off area, be careful to watch for passing traffic around children and dogs. in a medical emergency the cape cod national seashore park rangers may clear out the unloading area to make room for an incoming ambulance. we once observed an irate family man yelling back at a park ranger after a pedestrian accident in the parking lot. it was mystifying. the park rangers at the national seashore beaches do a great job, let them do their jobs – especially if its an emergency. Marconi Beach has excellent bathroom facilities, changing rooms and a shower area for rinsing off with fresh water. parking fees at the cape cod National Seashore beaches are used to build and maintain the park infrastructure, and the national park employees do a great job of keeping the restrooms clean. marconi beach has Recycling and garbage dumpsters available. make sure to bring all of your trash off of the beach. don’t be afraid to pick up extra trash someone else might have missed. Try to minimize the impact of tourism and preserve the beauty of this beach for your next visit. 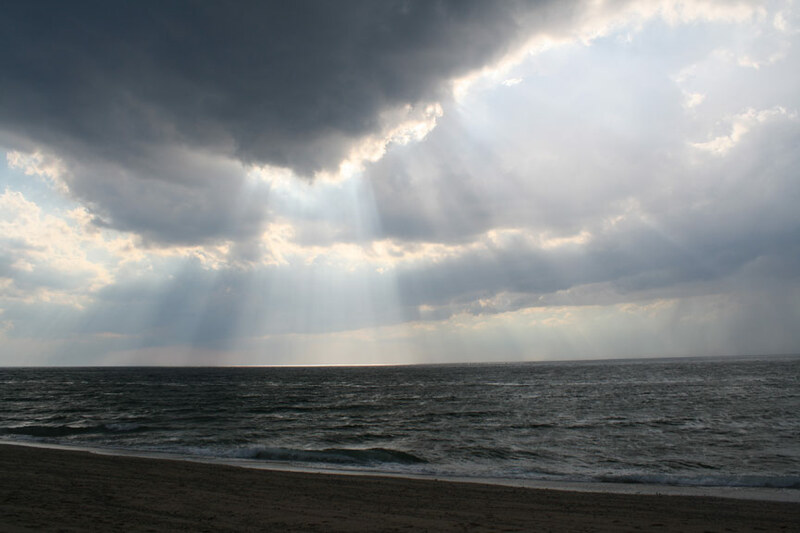 marconi beach in wellfleet is very important in the history of electronic communication. Marconi beach the original site of the Marconi wireless program. Guligiemo Marconi built his wireless station here, where he sent the first wireless transatlantic communication in 1903. Distress signals from the doomed ocean liner the titanic traveled through this site in 1912. Later the station was moved to chatham where there is now a museum dedicated to marconi’s work. At Marconi beach, you can see a small scale replica of the original site. Be aware that this visiting area does not allow dogs. Nauset Light Beach in Eastham sits a few miles further east up along route 6. Nauset light is a very popular beach in july and august. expect the parking lot to fill very quickly on weekends, plan on being there by 9am to ensure a parking spot. An adjacent town-owned parking lot is available to Eastham residents only. The first national seashore managed beach you’ll reach as you travel up route 6 from mainland massachusetts is coast guard beach in Eastham. coast guard beach’s picturesque dunes and sand quality consistently rank it on lists of the top 10 beaches in the United States.